Kale seems to be popping up everywhere lately – and with good reason! This green veggie is a nutritional powerhouse, packing in a ton of vitamins, such as vitamins A, K, E, C and folate, along with minerals, such as calcium. However, I think one of the most interesting things about kale is the fact that it can actually be a satisfying alternative to some foods that may not boast many health benefits, such as potato chips. Intrigued? Thought so! Read on to learn why kale is showing up everywhere, what to do with it and what you’ve been missing out on! Commandment #1: Try it, you just may like it! I get it, the green veggie may have a bad rep since it is purported to taste bitter or chewy or my personal favorite, “leafy”. However, if you’ve had kale taste this way, it probably just wasn’t prepared correctly. 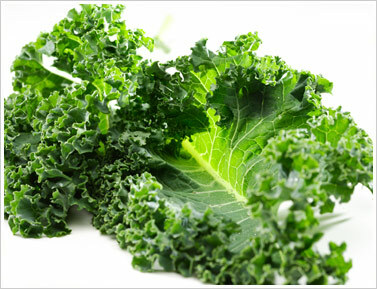 When used correctly, kale can offer a heartier taste than many leafy greens and actually taste sweet. So, even if you’ve tried it, or smelled it, or looked at it, and decided that it wasn’t for you, just give this curly veggie another chance. In fact, it takes most people multiple exposures to a new food before someone actually enjoys the its taste. I know – a potato is a vegetable, too. Albeit, a starchy vegetable. Nonetheless, I am all for potatoes. But let’s not pretend that the potato chip has any semblance to an actual potato. I like my chips with my sandwich as much as anyone else, but not only do I know that eating potato chips everyday isn’t the wisest choice – I just don’t feel good about eating potato chips everyday. My body works hard for me, and I like to treat it with respect. (Do I still eat potato chips, sometimes? Of course. But in moderation!) Enter the kale chip: crunchy, salty, tangy, and every bit as satisfying as a potato chip, but with way less fat, way more fiber, and a ton of nutrients. I like to make my own by simply drizzling olive oil (lightly) over kale leaves (stems removed), with some salt and pepper. You can also add garlic powder and cayenne if you like some extra spice. The kale chips bake at 350 degrees F for about 15-20 minutes. Not in the mood to make your own? There are a ton of brands that now sell kale chips. My favorite brand is Brad’s, which has a whole line of different kale chips (my favorite are the Raw Crunchy Kale Chips with vegan cheese). Just be careful when purchasing the kale chips (as opposed to making your own) since a lot of brands add a ton of fat and salt, so the nutritional value is trumped by the processing. In case you didn’t know, the reason kale is literally popping up everywhere now is because it is in season. That means that you can purchase kale at local farmer’s markets right now! While food that is in season simply tastes better (at least, I think so), it also is really helpful for the environment and your community. Eating locally and seasonally means you can support small farms and eliminate the carbon footprint that comes along with transportation. Think about it: when you eat food grown in another part of the country, or another country entirely, it has to arrive here (wherever “here” is for you – for me it is NYC). How does it get there? Well, I can promise you it doesn’t walk. Instead, it is usually by truck or plane. Shopping at farmer’s markets and supporting local grocers helps to decrease the carbon emissions that would normally accompany the traveling food. Not to mention, when you eat locally, you get the benefit of consuming that food soon after it has been harvested. This means better taste, longer shelf life and a better nutrient profile. As if that is not reason enough to eat locally and seasonally, it may also be of interest to you that some studies have demonstrated that farmer’s markets help to connect communities and increase the overall pleasantness of a task that is normally mundane – grocery shopping. By going to farmer’s markets, you can have conversations with the farmers and find out how the food was grown and harvested. Also, farmers at farmer’s markets often have free samples or recipe ideas and can help you figure out a tasty way to enjoy the food. Personally, I like to go straight to the source for my nutrition. Find out where farmer’s markets are near you and start reaping the benefits of fall by purchasing local, in-season kale. From the NYC area? GreenMarket NYC is in charge of organizing all of the farmer’s markets. You can log on to their website and find out when and where the farmer’s markets are! my warm kale and butternut squash salad! I know, you like your spinach, or romaine, or arugula. But kale has an interesting taste as a lettuce, served hot or cold. Served cold, kale is crunchier than the other types of greens often used as lettuce. It has a heartier, crisp taste that is more satisfying and adds a little something extra to your plate of veggies. Served hot, kale tastes similar to spinach, but seems slightly heavier. It holds up well as a base for a salad, without overpowering the dish. 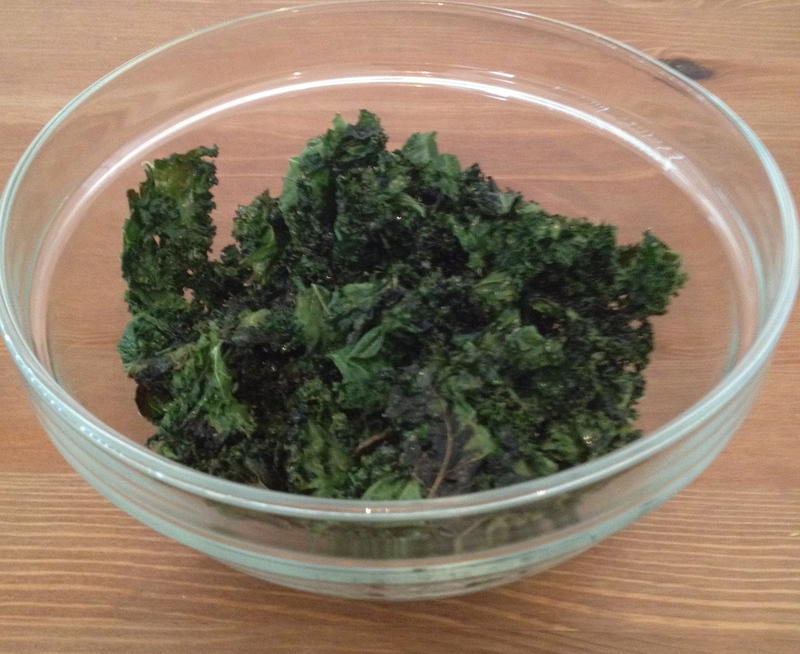 If you serve kale cold, you’ll want to use an acidic ingredient, so that the kale softens and tastes less bitter. This also allows the nutrients to be more bioavailable, since it initiates the breakdown of certain indigestible plant components. I like to marinate my kale with lemon juice for some time before I use it (usually about 30 minutes or so). You can also make a great salad dressing using lemon juice, olive oil, red wine vinegar, salt and pepper. In the mood for a warm salad? (In these chilly temps, why wouldn’t you be?) 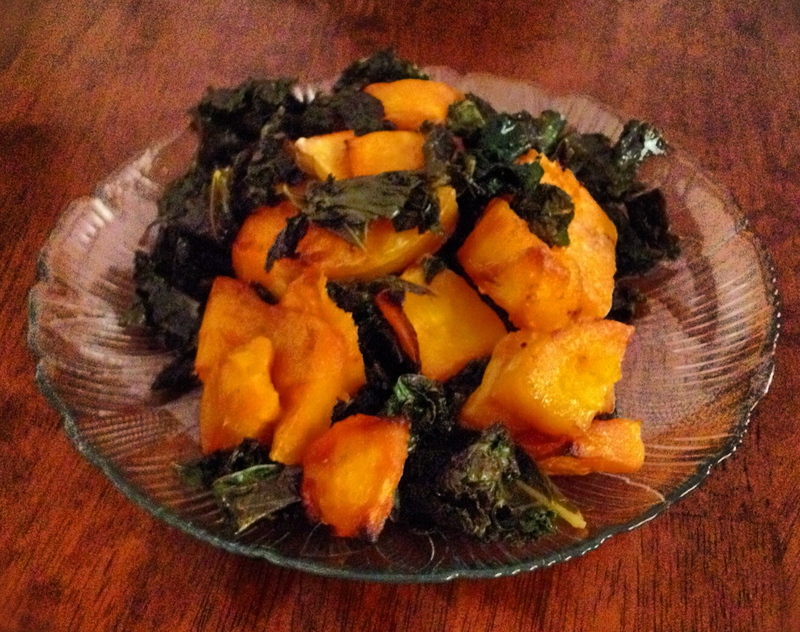 Check out my warm kale and butternut squash recipe (on my blog) and enjoy some of the best fall flavors offered. Looking for more of a side dish? Saute kale, like you would spinach, until wilted, except leave it on the heat slightly longer than you would to cook spinach. This prevents the kale from tasting bitter. Adding a drop of soy sauce or sugar can also help. I like to mix kale with spinach and chard for a side dish with more texture and flavor than your standard sauteed spinach. 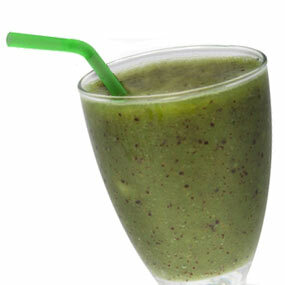 Commandment #5: Green-ify your smoothie or juice. Juicing has become a cult. No, not really, but I know that people love their juices. While juices are a great alternative to many other beverages, such as soda or other sugar-sweetened beverages, like sweetened tea and juice, many of them contain a lot of sugar, zero fiber and not much else. Adding some veggies, like kale, to your juices can deliver a hearty dose of vitamins and minerals. Just be aware that you are still not getting the fiber that you actually would from eating the whole foods that are juiced. My verdict? Great in moderation, or a good alternative to high-calorie, processed beverages (milkshakes, sodas, frozen blended concoctions) . But if you were drinking water and eating whole fruits and veggies before? Keep it up. Nonetheless, kale can amp up your juice (every once in awhile), and the addition of vegetables (as opposed to using lots of different fruits) doesn’t contribute as much to a high sugar content. Use the fruits sparingly, to add a light sweetness. Juice Generation has a great juice made with kale, lemon and watermelon. Keep it simple, light and slightly sweet! Want more of the health benefits of kale (and other fruits and veggies)? A smoothie may be the way to go. By blending the whole fruit, you reap the fiber and forgotten nutrients. 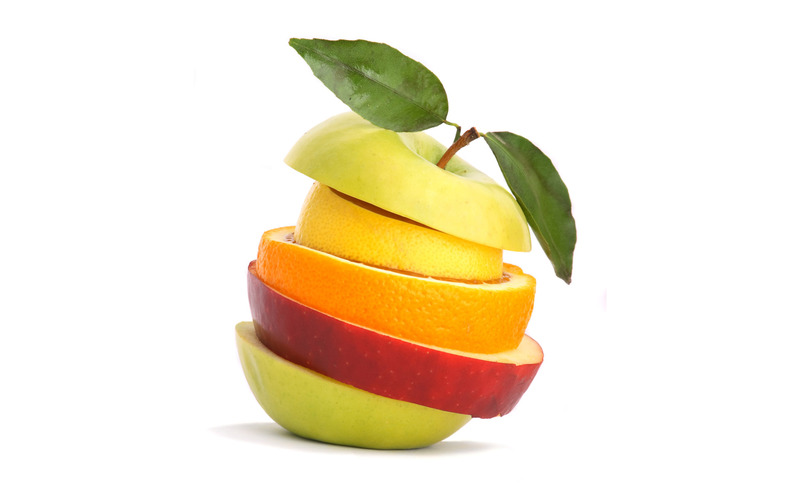 Offset the vegetable-taste with natural sweetness, such as apples, mangoes, pineapples, watermelon or other sweet fruits. Craving a creamier smoothie? Add nonfat, plain Greek yogurt, rather than just ice, for some extra protein and creaminess. Going green just got really tasty! Hopefully by now I have convinced you to keep an open mind about kale and experiment with the many ways kale can be enjoyed. I think you’ll find that after trying kale in some of these ways, you’ll not only be fueling your body well – you’ll enjoy doing it! This simple salad is a cinch to put together and is a great salad to use for entertaining, or to pack for the day to load up with good nutrition on-the-go. 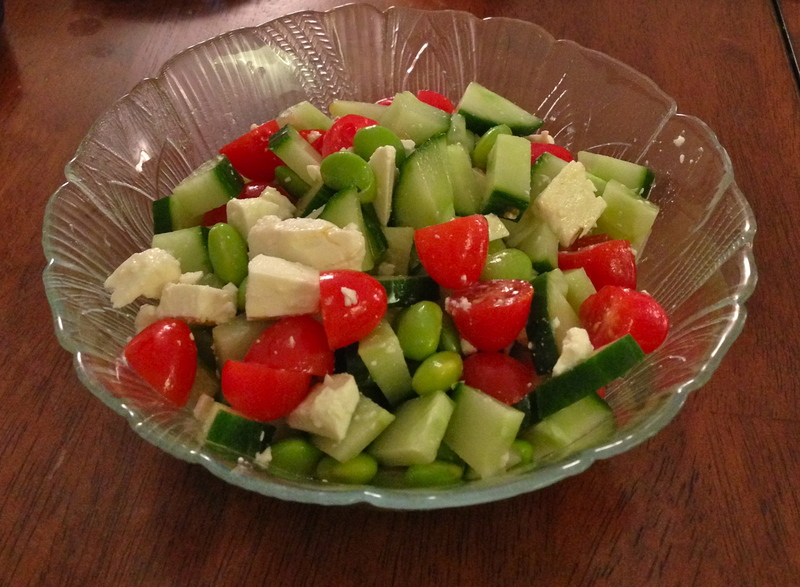 Edamame contains soy protein, helping to to fill you up without filling you out. Also, tomatoes contain lycopene, which is a potent antioxidant. But you won’t even be thinking about how good this salad is for you when you’re eating it- you’ll just be thinking about how good it tastes! *If your soybeans are salted, you may choose to skip the extra salt -this can make your salad taste too salty and also makes the sodium unnecessarily high. 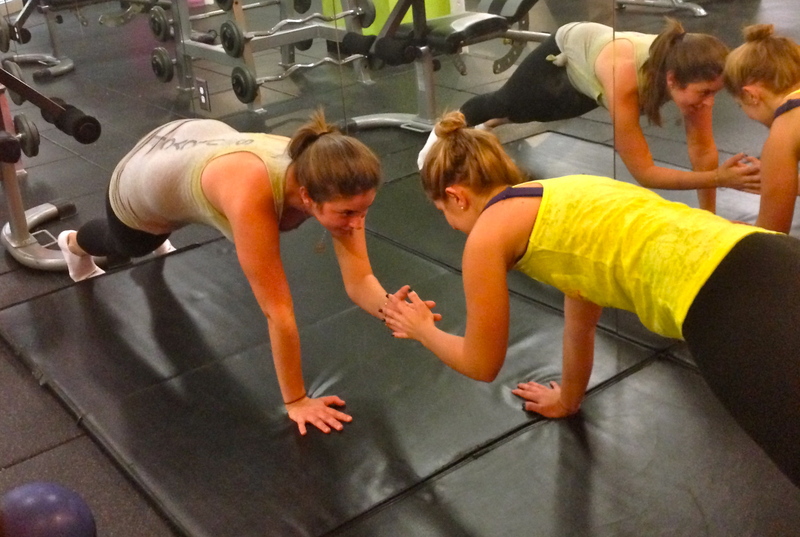 Why Work Out With a Friend? So, why should you grab your spouse, significant other, friend, sibling, acquaintance (or anyone for that matter) and bring them to the gym with you? There are actually a few reasons. 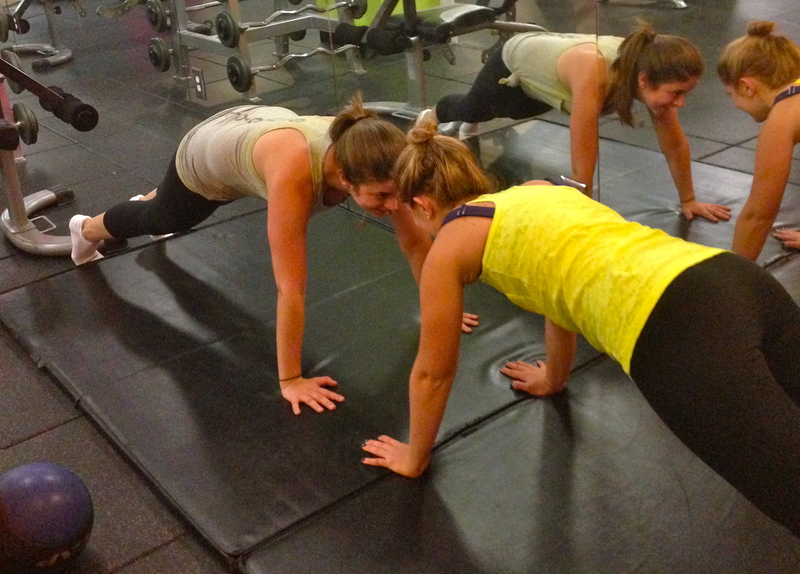 Making plans with someone holds you accountable, so you’ll be less likely to blow off a workout. 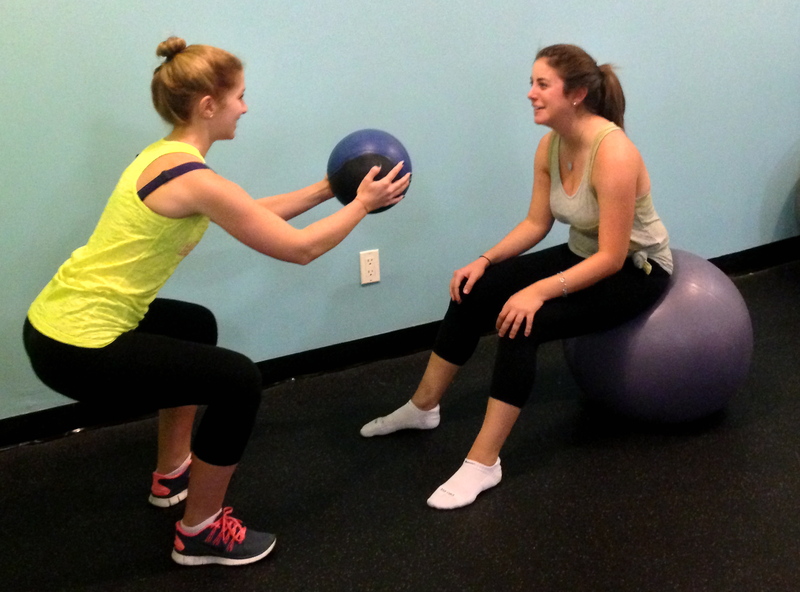 Additionally, working out with someone allows you to take advantage of exercises that you wouldn’t be able to do on your own, plus partner stretches can really push muscles to the limit and help your muscles to be long, lean and injury-free! 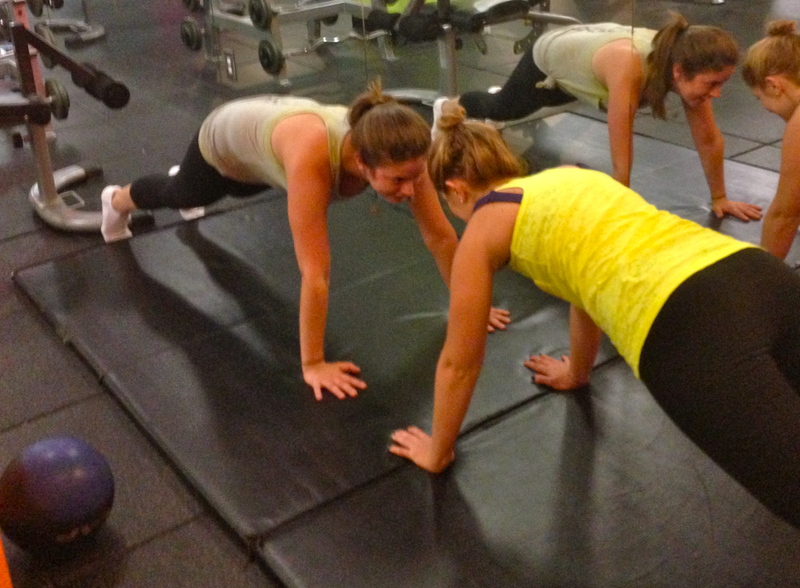 Also, working out with someone you enjoy spending time with is FUN! As if I really needed to say the last reason. Grab your partner and get sweatin! Below are a few of my favorite partner workouts, plus a partner stretch, to keep you and your buddy active, strong and toned. 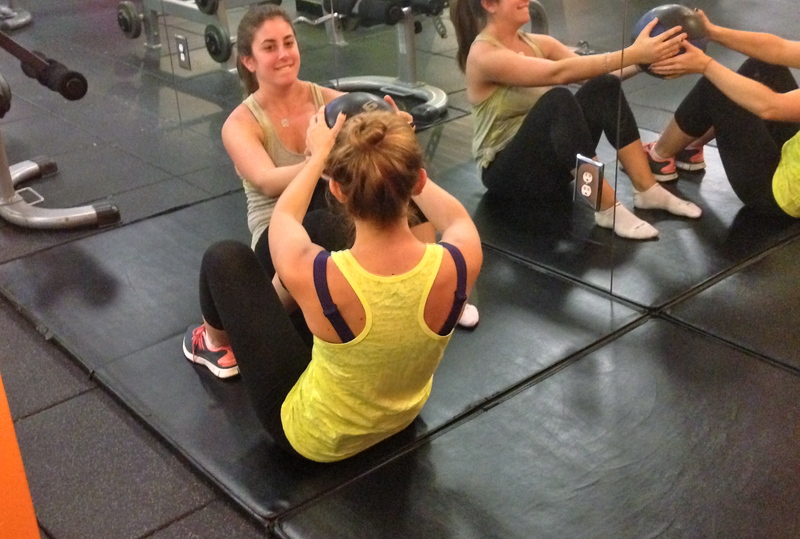 Your workout just got a lot more fun! 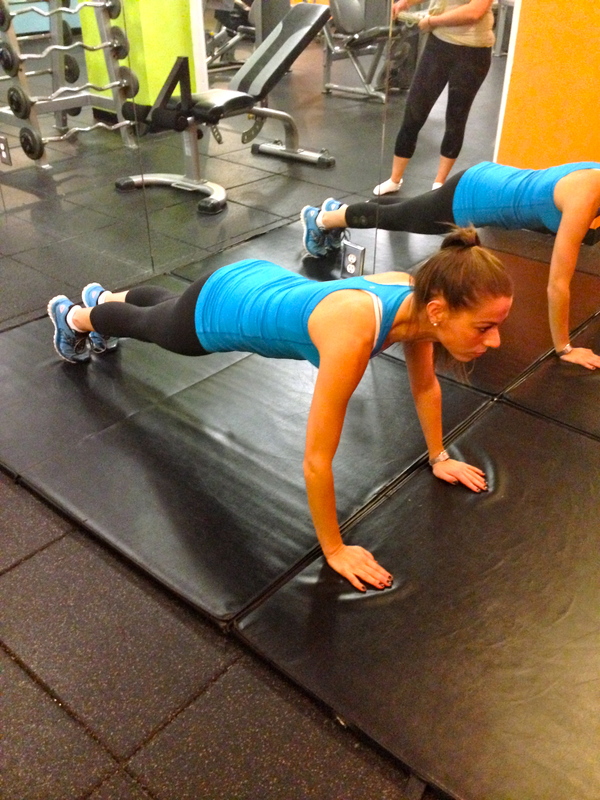 Lay on your back, in “crunch” position, facing your partner, with your feet in one straight line (all four of them!). 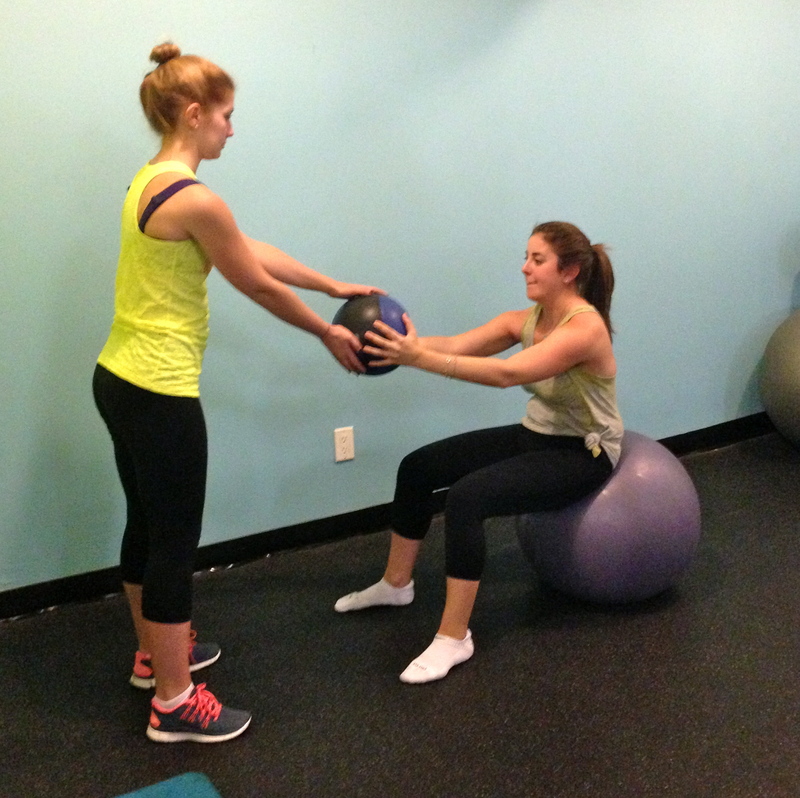 One partner holds the medicine ball overhead (typically a 6 lb. 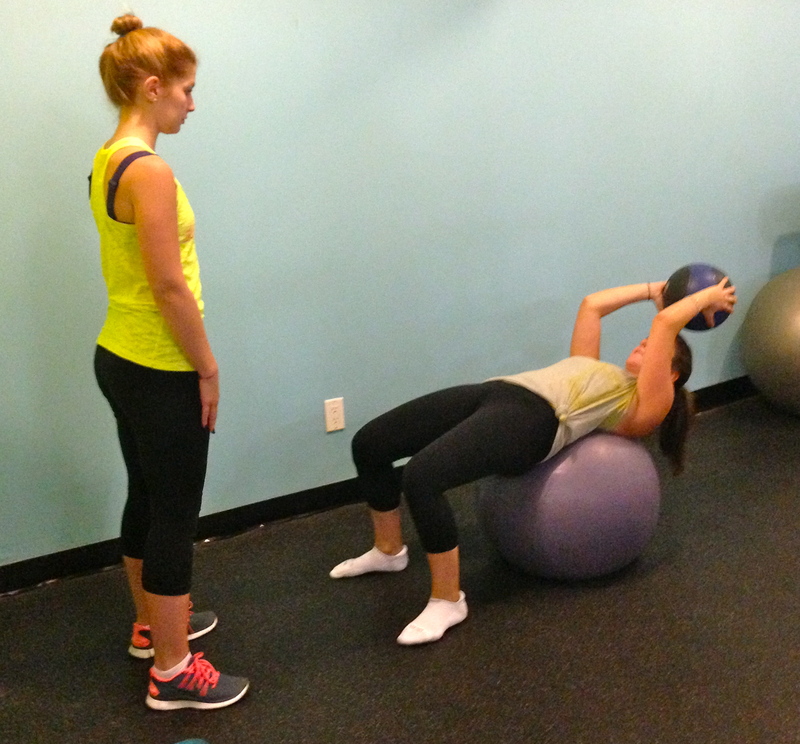 ball should work well for this exercise, but this may vary) and both partners lift at the same time and twist toward one another. 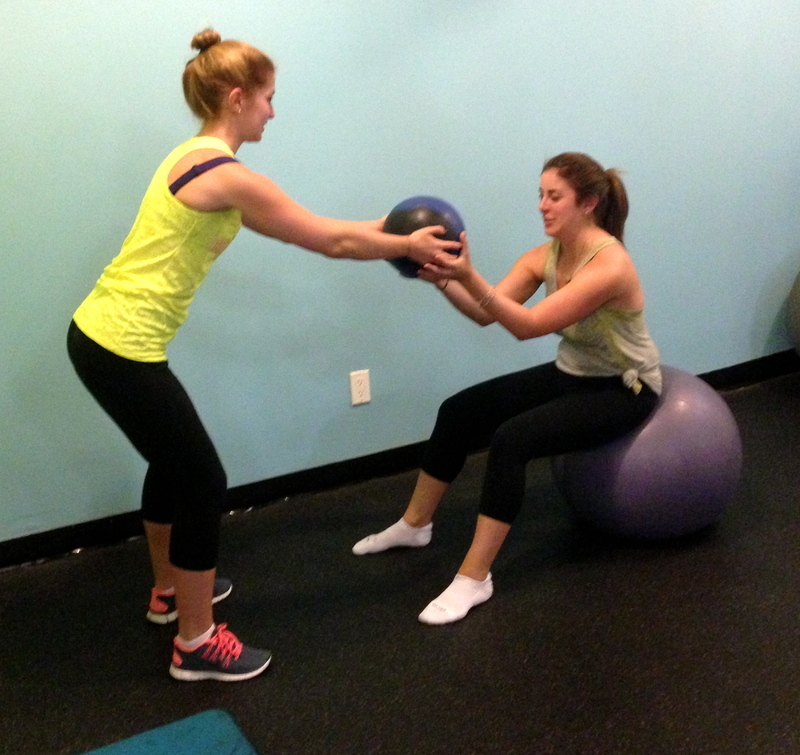 Pass the ball to the other partner and return to start position, with the medicine ball in the second partner’s hands. Now repeat so that the ball gets passed back in the same way, back to the first partner. 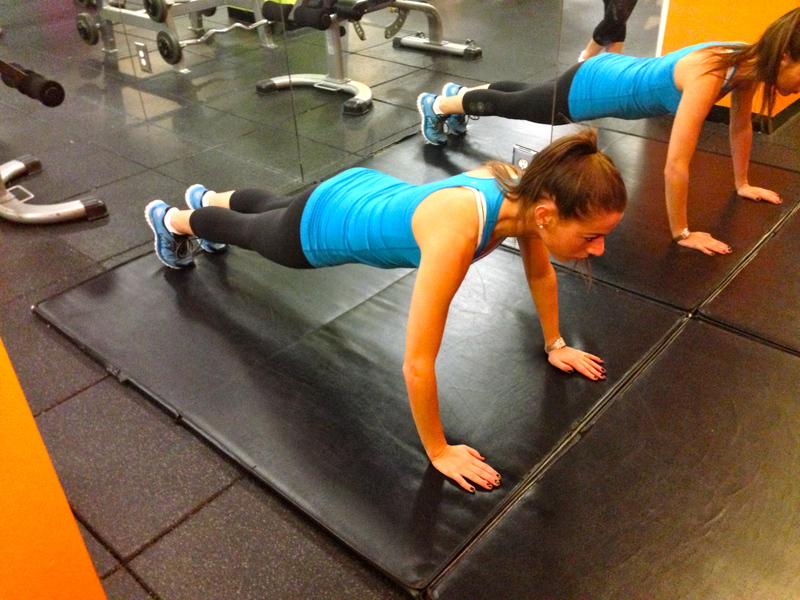 Do 3 sets of 10-15 reps and then switch sides (so you’re twisting to the other side). 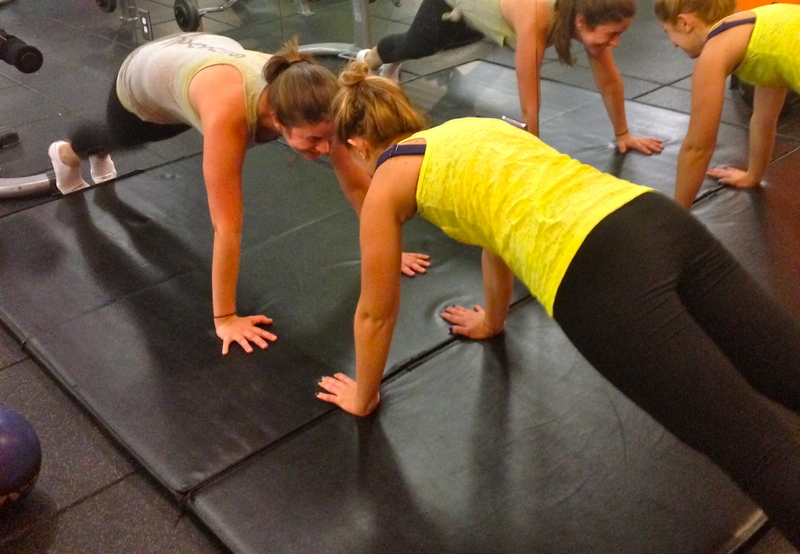 Get into your yoga plank position (back straight, elbow joint direction under shoulder joint), facing your partner. At the same time, both you and your partner will shift your weight into your left arm/hand and lift your right hand off the floor, slap each other’s hand, and place your hand back down. 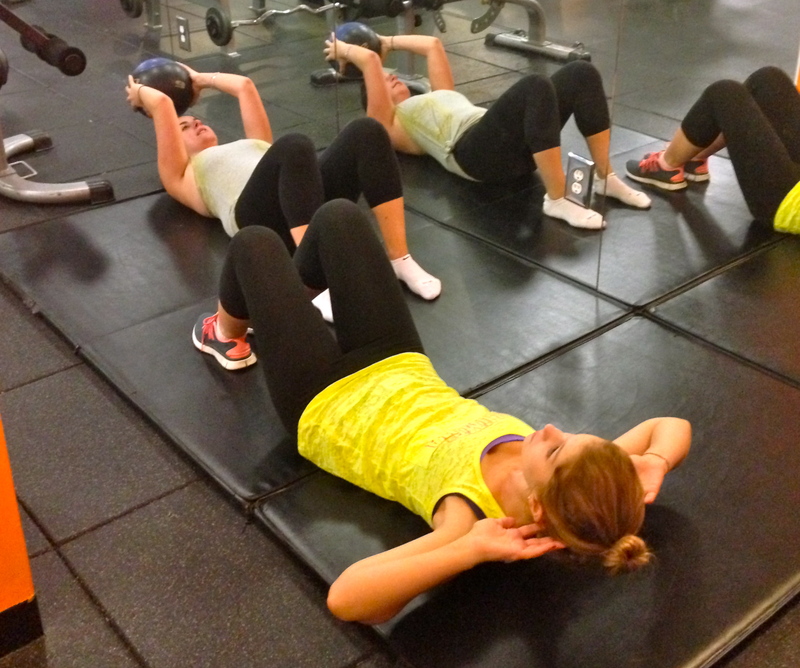 Repeat, this time shifting your weight into your right arm/hand and lifting your left arm. Both hands lift for 1 rep. 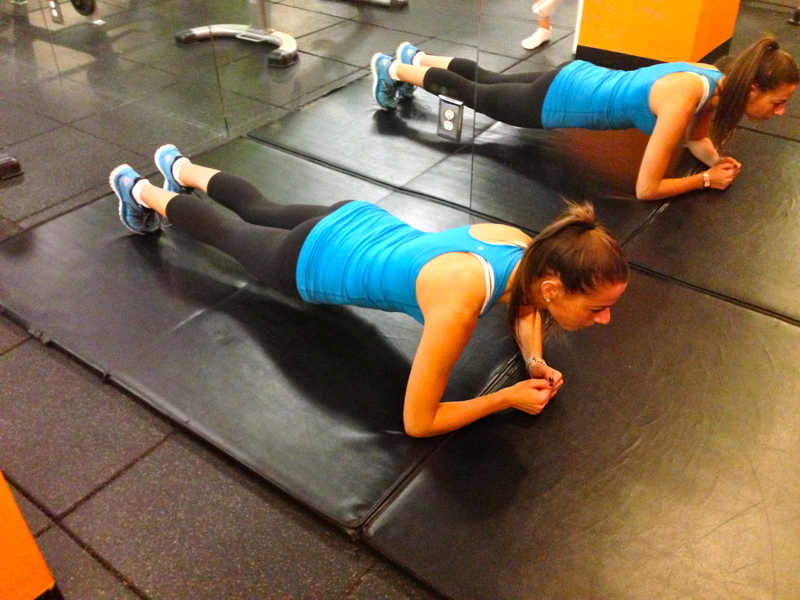 Perform 3 sets of 10-20 reps, depending on how advanced you and your partner are. 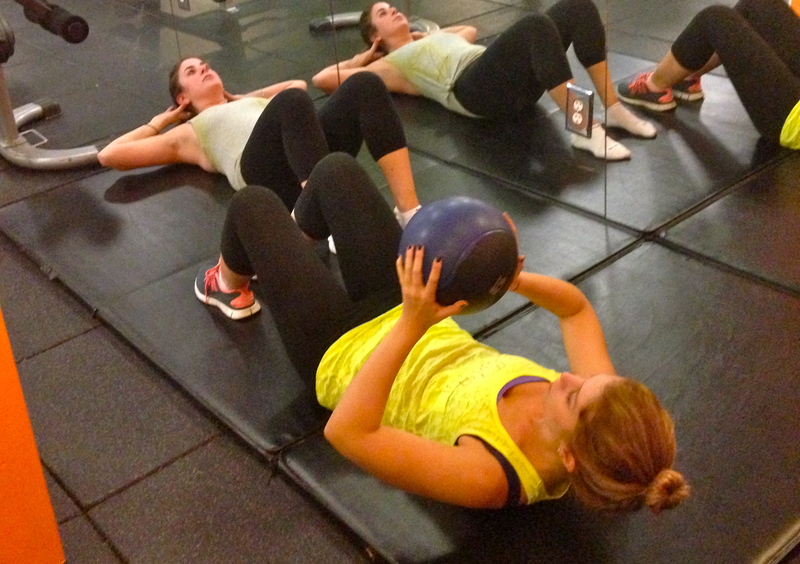 For this exercise, one partner will lay on a resistance ball with feet firmly planted on the floor, holding a 4-6 lb. medicine ball overhead. 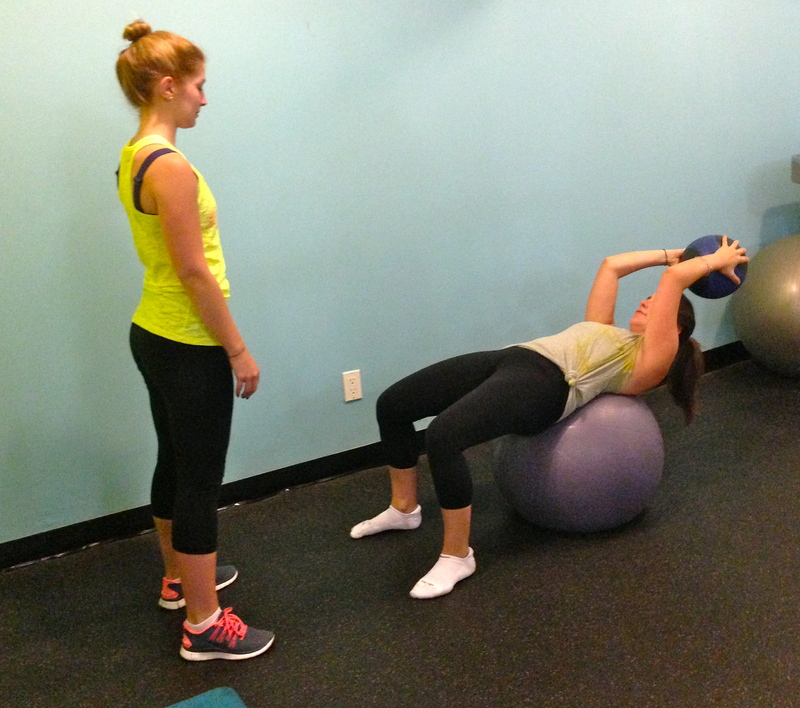 The resistance ball should be in contact with your lower – mid back. The second partner should stand a couple feet apart, with feed about hip-width apart and knees soft. 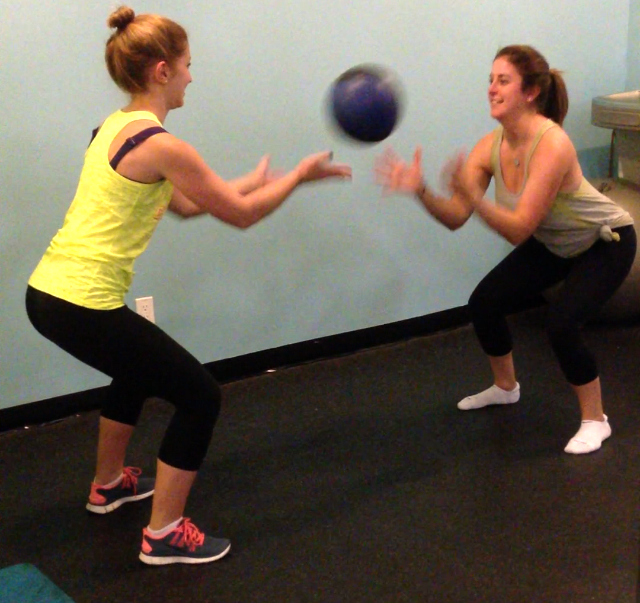 The “crunch” partner will crunch up, pass the medicine ball to the “squat” partner, who will then take the medicine ball and squat before coming back up and passing the ball back to the “crunch” partner. Then, the “crunch” partner will return to the start position. That counts as 1 rep. Perform 3 sets of 12-15 reps. This one is really fun and reminds me of playing catch when I was younger. Stand a couple feet away from your partner, with feet about hip width apart. 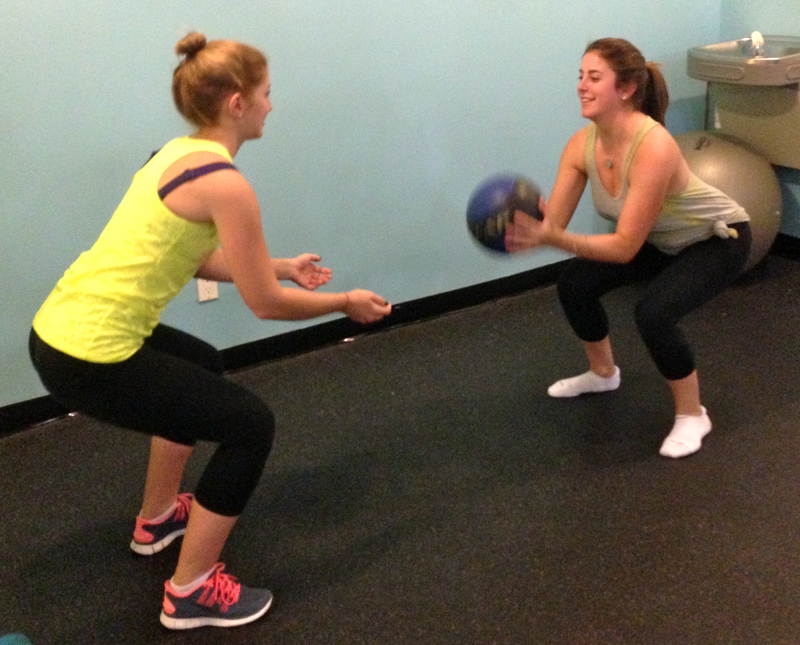 Both partners will squat, while only one partner will hold a medicine ball (4,6 or 8 lb. should work for most). 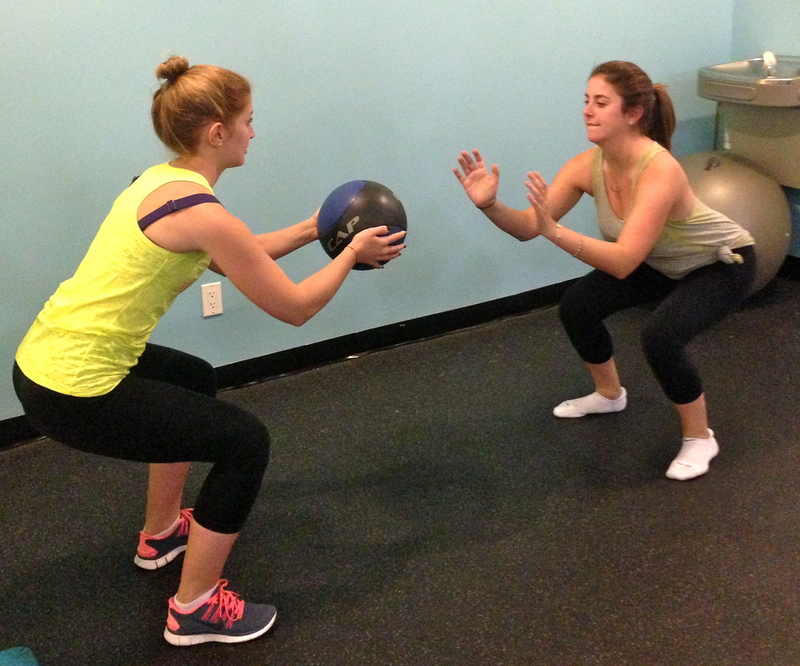 While remaining in a squat the entire time, gently underhand toss the ball to your partner and have your partner pass the ball back to you. Continue this for 1-3 minutes, lowering your squat every 30 seconds (since your legs will stretch and you will be able to go lower as time goes on). More advanced? 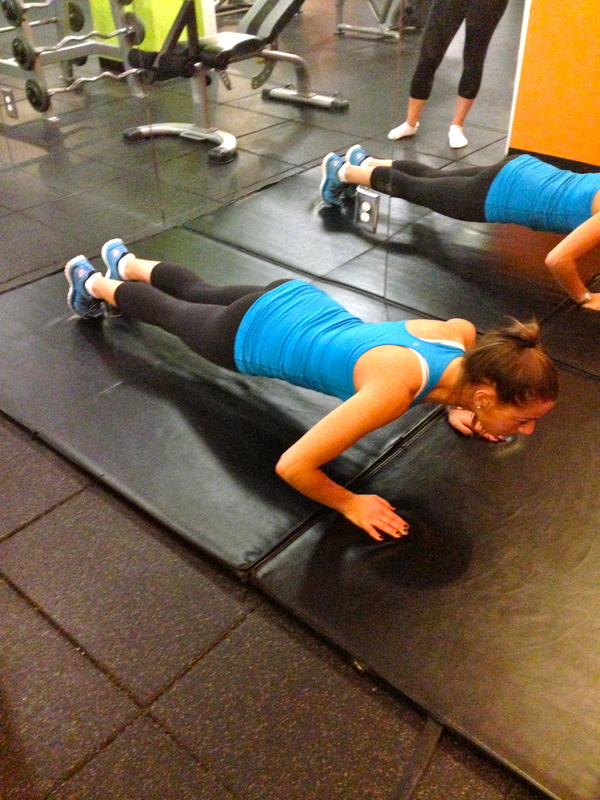 perform more than one set, or add on another minute! This stretch is really great for tight hamstrings. Lay on your back in with legs bent and feet on the ground. Raise one leg and have your partner gently push your foot closer toward your head. Hold for 10 counts and then have your partner gently push slightly further. Hold for another 10 counts. Repeat on opposite legs, then switch and help your partner stretch. 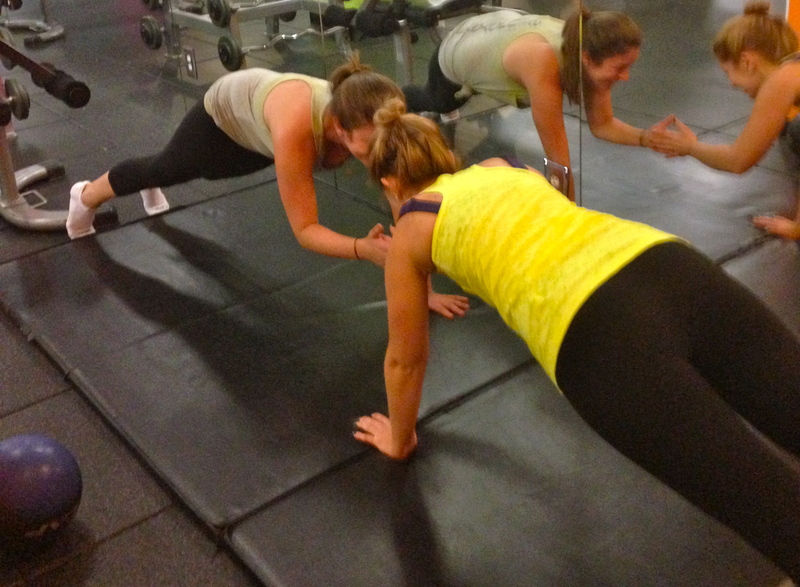 **Special thanks to my friends, Casey and Ruthie, for demonstrating these moves! This chillier weather makes me want to bake and enjoy the scent of warm, freshly baked muffins filling my apartment with some hot tea. I slimmed down banana walnut muffins by swapping out some all purpose flour for whole wheat flour, replacing oil with fat free Greek yogurt and increasing the amount of bananas, so the muffins stay moist and sweet – naturally! 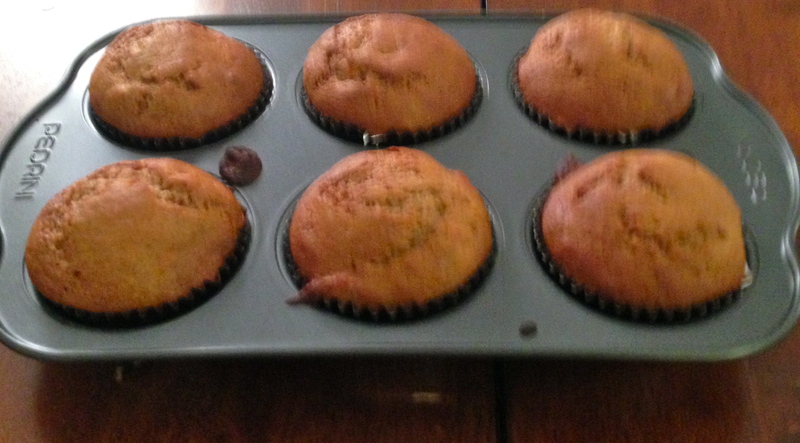 These muffins are great as a snack to pack for work or school, or amazing with a cup of coffee or tea in the morning. A great bonus? walnuts are a great source of omega-3 fatty acids, which help to decrease inflammation. Who says you can’t have your muffin and eat it, too? 2. 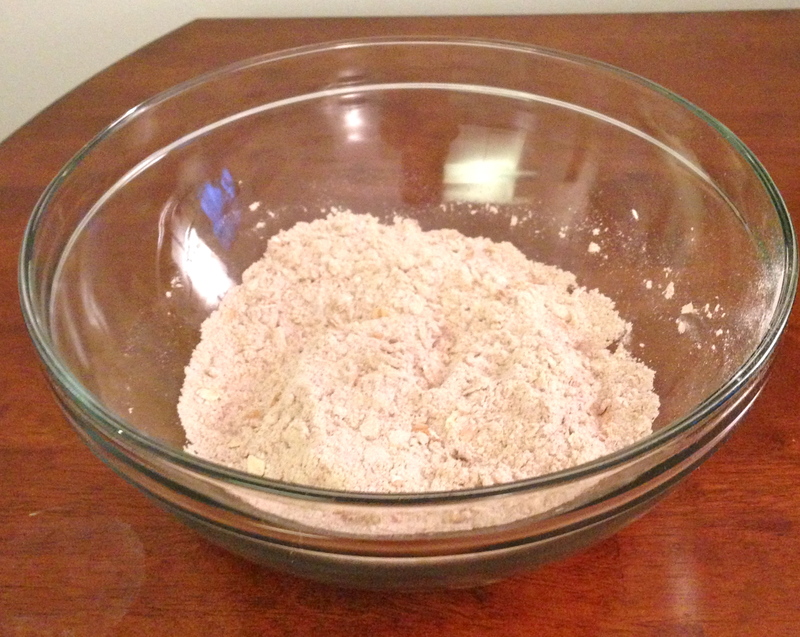 Combine flour, baking soda and salt in medium sized bowl. Set aside. 4. Beat remaining 2 bananas with honey and brown sugar (about 2 minutes). Add yogurt, eggs, vanilla and beat well for another 30-45 seconds. 5. 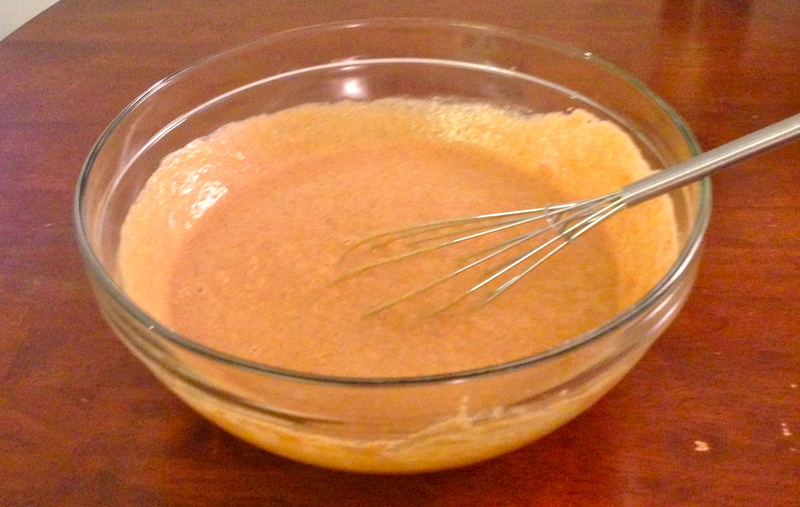 Mix in about half of the dry ingredients and stir with rubber spatula. Add remaining half of dry ingredients. 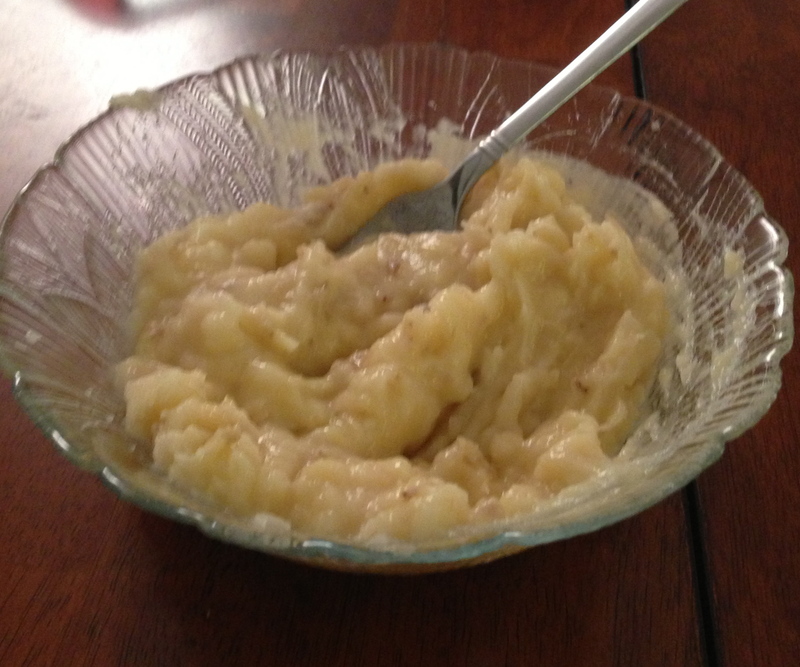 Fold in nuts and mashed bananas to batter. 6. Line muffin tin with cupcake liners. 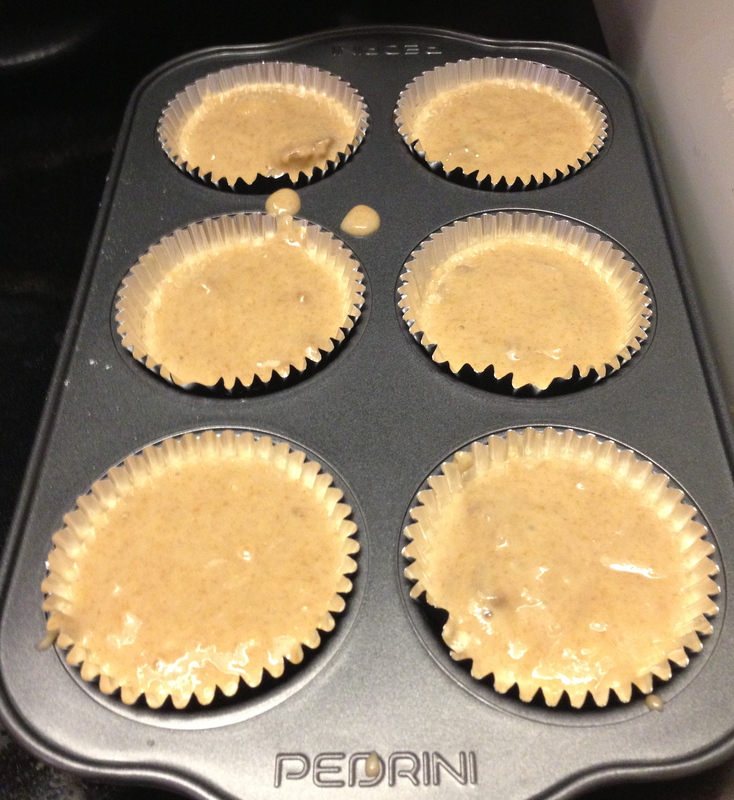 Spoon batter into muffin tins so that each cup is about 3/4 full. 7. Bake for approximately 25 minutes (until the muffins pass the “toothpick test” – a toothpick should come out of each muffin mostly clean). Serve warm or at room temperature. 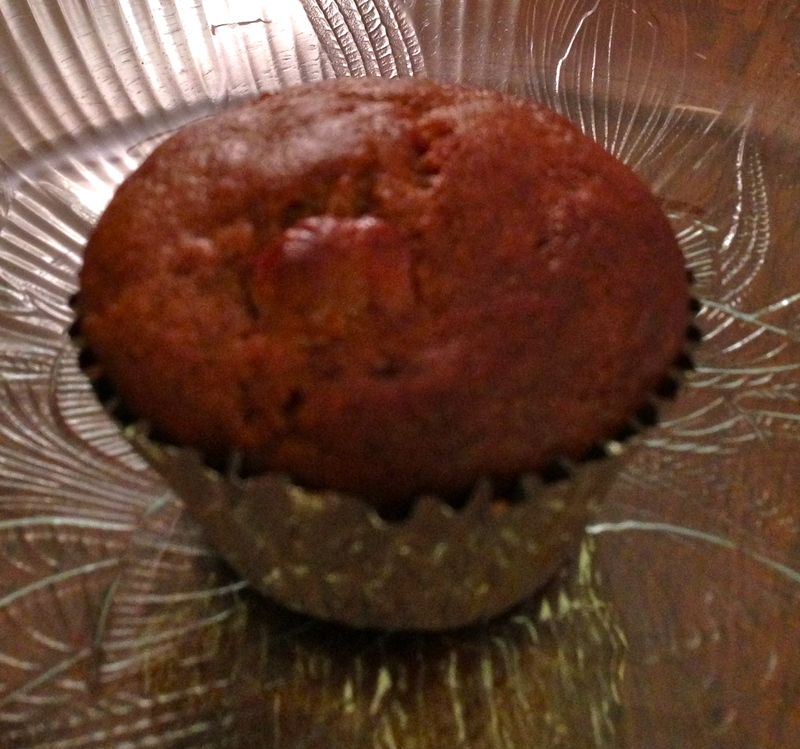 warm, fresh baked banana walnut muffins! I have noticed that many people I know are concerned about snacking. In fact, it seems as though people are afraid of snacking, which is upsetting because eating (including snacking) should be a joyful experience. You are giving your body nutrients so that it can be strong for you and you are also enjoying the smell, taste and texture of the food (or at least you should be!) However, when it comes to snacking, I think some people are confused about which snacks are “good” or “bad”. I do not like to think of food in terms of “good” or bad”. Food is food. It can taste good or bad, but it is not, in itself, good or bad. Instead, I try to eat different types of food in moderation. For example, I often cook healthful breakfasts, lunches and dinners and usually eat fruit, vegetables or yogurt in between meals. However, if I want a cookie, or a muffin, or some other “treat” one day, I will likely have it – as part of a balanced diet. This concept seems to provoke a strong reaction in many people, as it seems many people associate foods such as cookies or ice cream with guilt. It is time to work on your relationship (with food) and befriend the enemy. This is a break-up with your diet habits. Dieting does not usually lead to long-term weight loss. Skipping meals (and snacks) could cause binge-eating later, along with feelings of deprivation, guilt and behaviors associated with disordered eating. Instead, it is finally time to begin a new relationship with food – a healthy relationship, in which there is respect, peace and happiness. Now, I know many people want to enjoy snacking – who wouldn’t? However, confusion and anxiety about how to snack can certainly take the fun out of what is supposed to be both enjoyable and beneficial. So I am here to sort out fact from fiction, and offer up some of my favorite snack ideas, from whole foods to packaged goodies. After hearing my side, hopefully we can work it out. So, what is a “snack” and how does it differ from a “meal”? Truth is, depending on what works for you, a snack may not be any different from a meal. Many people find that eating multiple, small meals during the day helps to keep them feeling full and provides their bodies with adequate nutrition. However, if you are eating three meals a day (which, at a minimum, you should!) 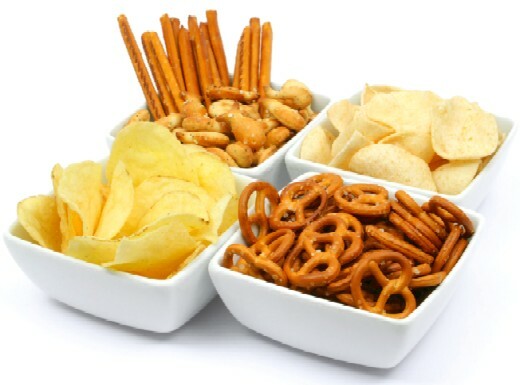 snacking is often a helpful way to keep your metabolism humming and tide you over until your next meal. Ideally, if someone is on a 1,800 calorie – 2,000 calorie diet (by “diet” I mean their average dietary intake, not a “diet” in the typical sense), meals should approximate 500 calories each, leaving 300 – 500 calories for snacking. (It should be noted that everyone’s caloric requirement is different and this is just an example). An ideal snack is typically thought to be about 150 – 300 calories, although this can obviously vary from person-to- person and time-to-time. Snacks should usually consist of foods that offer healthful benefits, for example, a fruit that offers fiber along with vitamins and minerals. However, a snack can also be something that isn’t so much a contributor to your nutrient-dense calories, but rather, something you want to eat and can eat in moderation, knowing that your nutrients are coming from elsewhere in the diet. So it’s okay to break out the chocolate and ice cream every once in awhile – this is a break up after all. Just remember the foundations of good nutrition: balance, variety and moderation. So, hopefully by now you are feeling that not only is it okay to snack – you are encouraged to snack. Just snack wisely (most of the time)! here are some of my favorite snacks, ranging from unprocessed fruits and vegetables to pre-packaged, store-bought convenience items. This is an easy one. Need an on-the-go snack? Whole fruits that you can bite into, such as apples, pears, peaches, plums, apricots and bananas are great, portable options. Additionally, you can cut up fruit when you do have the time so that when you are busy, you can just reach for the container (or bag, or whatever you choose to store your cut up fruit in) and bring it with you. Dried fruit is also a good option – just be aware of the sugar content. The process of drying is a dehydration process and usually sugar is used to attract water out of the fruit, increasing the sugar content of the fruit once it has been dried. If you’re at home, you can enjoy some of my favorite snacks and desserts: cut up grapefruit, broiled grapefruit with brown sugar, melted dark chocolate with strawberries and bananas, banana slices with peanut butter, frozen grapes or frozen dark chocolate-dipped bananas. Right now, clementines are also especially sweet! I like to bring sliced bell pepper, cucumber and carrots with me and usually I will bring a small container of hummus. The vegetables on their own do not contain many calories, but they offer a ton of vitamins and minerals and are full of water and fiber, which help to keep me full. Hummus helps to fill me up if I want a heartier snack and adds even more fiber. Edamame is another fun snack. A great tip is to sprinkle on the salt after you have heated the soybeans, since you will be able to taste the crystals that are on the surface and can use less salt. Edamame is also great on its own, eaten warm or cold. Also, I am unashamed to admit that I still eat ants on a log – more appropriately referred to at my age as celery with peanut butter and raisins. 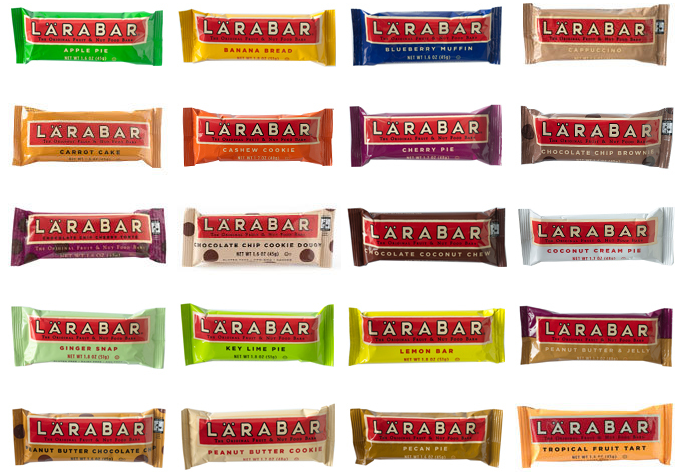 I have recently become addicted to Larabars. These bars are minimally processed and contain very few ingredients (some bars only have 2 ingredients! ), all of which I can pronounce and recognize as food items. While many granola bars and other on-the-go bars contain ingredients made in a laboratory and cheap, added fibers, such as inulin, which can often cause gastrointestinal distress, Larabars are made from dates and contain a few ingredients to enhance the flavor of the dates. The fiber and nutrients are all there, in a conveniently packaged bar that averages around 200 calories. My favorite flavor is peanut butter chocolate chip! I also make my own trail mixes, using individually packaged nuts, seeds and fruit. Here is my favorite combination: cashews, peanuts, sunflower seeds, dried blueberries, pieces of dark chocolate. Try to find unsalted or reduced-salt versions of nuts when making your own trail mixes. My favorite go-to snack when I crave creaminess is Greek yogurt. 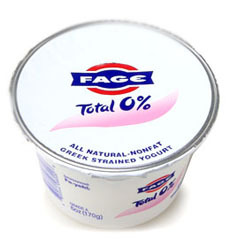 I like Fage 0% plain, which contains few ingredients, among which are live, active cultures of beneficial bacteria that can colonize as microflora in the intestine and contribute to immune and digestive health. Bifidobacteria and Lactobacillus are the names of bacteria to look for when reading your yogurt label. I like to eat my Greek yogurt either with fruit, fruit and chocolate chips, fruit and honey, granola (usually my homemade granola, which can be found on this blog, although I also am a fan of Purely Elizabeth’s use of quinoa, chia, amaranth and other grains and seeds). I also like to put my Greek yogurt in a smoothie, whether it’s a light fruit smoothie (using REAL fruit) or a protein-packed peanut butter smoothie (which usually contains chocolate or a banana – or both!) If you’re craving ice cream, Breyer’s has a natural line that really hits the spot. I’m a fan of Breyer’s Natural Vanilla, which contains just four simple ingredients. I usually top my ice cream with some melted peanut butter to pump up the protein (and because I do not think there is any one food that I love more than peanut butter). 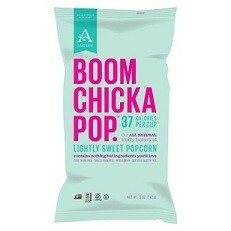 My most recent find is Boom Chicka Pop popcorn, which has a “lightly sweet” flavor that tastes just like kettle-corn. This popcorn is only 35 calories per cup, or 120 calories for each 3 1/4 C serving. Also, this snack packs in 5 grams of fiber per serving and is surprisingly not high in sodium or sugar. 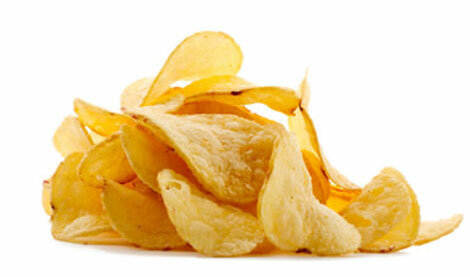 I also like baked chips or cape cod chips, which have considerable less fat than regular potato chips. When it comes to cakes, muffins and cookies, I tend to bake my own, since I can replace oils and other fats with more healthful ingredients, such as Greek yogurt, swap out some of the all purpose flour for whole wheat flour and ensure that I am aware of the amount of sugar I am consuming (and making sure that it is as natural as possible). It should be noted that black strap molasses actually contains calcium, so this sweetener is a wise choice. However, if you do not wish to bake your own baked goods, my advice is to read the nutrition label. Many of these commercially-sold baked goods contain partially hydrogenated vegetable oil, trans fats and a labyrinth of an ingredients label. 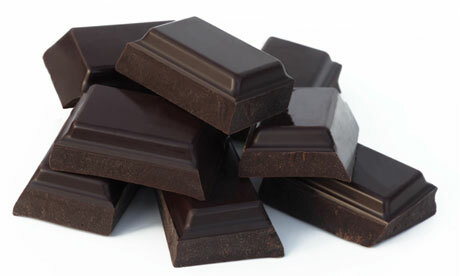 Try to focus on foods (processed or otherwise) that you can recognize as foods. If you do not recognize the ingredient (or can’t pronounce it, like many chemicals and food additives used), it is likely not worthy of entering your body. I hope I cleared up some of the rumors and preconceived notions about snacks. I like to follow the “80/20 rule” – make sure that 80% of your diet provides the nutrients you need and you can allow about 20% of your diet to be wiggle room. Your healthy relationship with food can involve snacking! In fact, snacking is a great complement to an active, healthy lifestyle. You must always remember to fuel your body – it works hard for you! 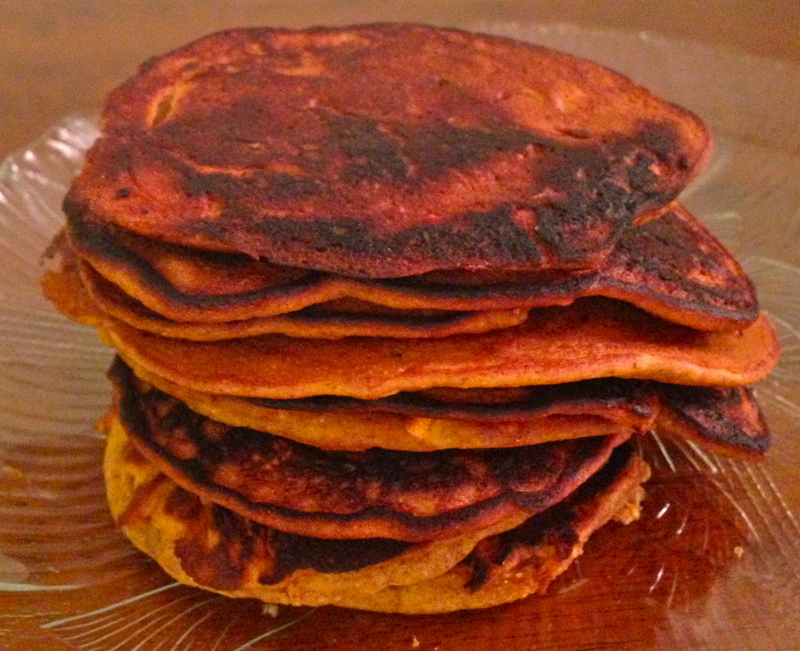 Fall For This Treat: Pumpkin Pancakes! In case you couldn’t tell, I’m on a pumpkin kick. That, and I had leftover pumpkin that I could not let go to waste! 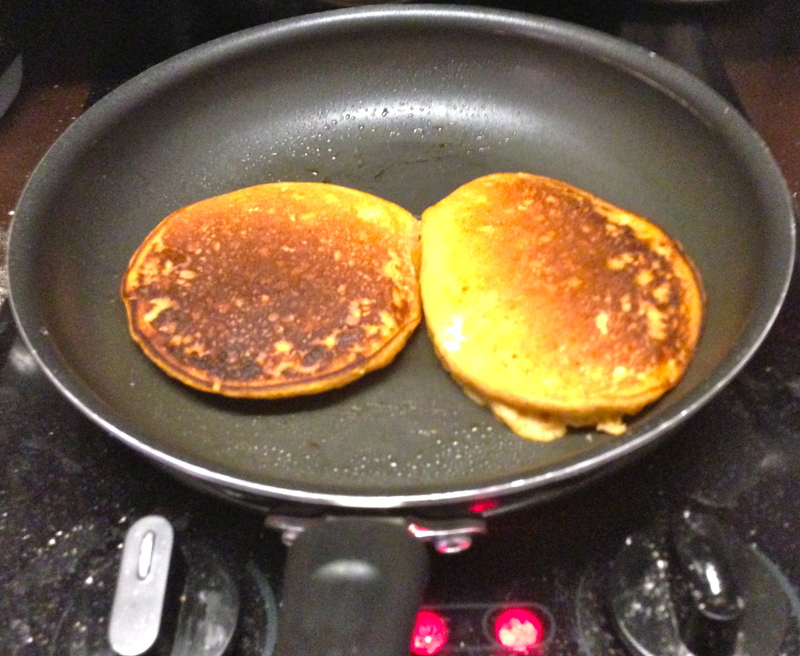 On a lazy Sunday morning, I decided to make these pancakes with a fall twist. These pumpkin pancakes contain whole wheat flour, rolled oats, 0% fat Greek yogurt and skim milk, so they’re slimmed down and packed with autumn-y goodness. Pumpkin contains beta-carotene, which your body can convert to vitamin A. Also, while pumpkin tastes hearty, each 1/2 C serving contains only 40 calories, 9 g carbohydrates and packs in 5 g of fiber! This autumn superfood is one of my favorite things about fall – now, if only it actually felt like fall outside and were chilly enough to start wearing my boots! 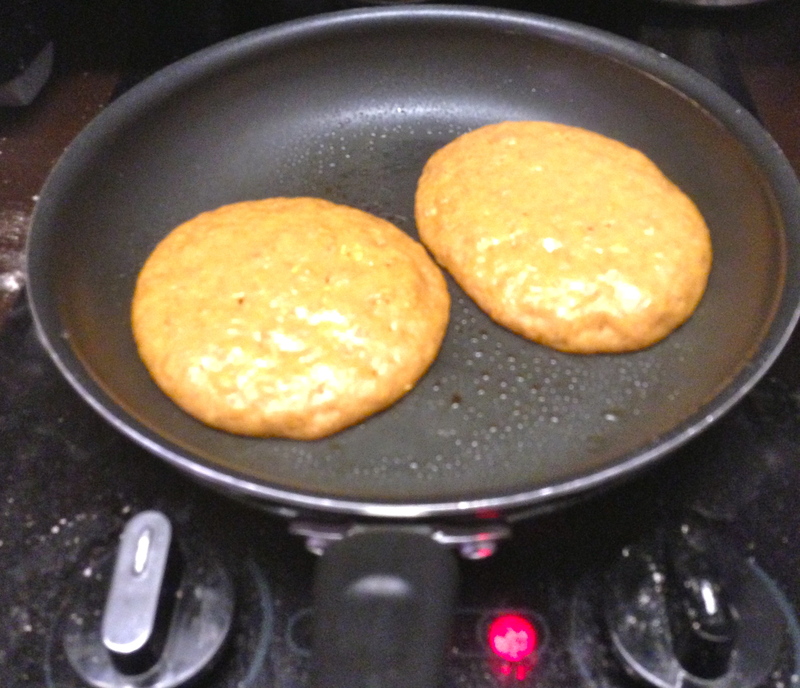 Until then, I will just enjoy these pumpkin pancakes! 2. Scramble 1 large egg and 1 large egg white in small, separate bowl. Set aside. 3. 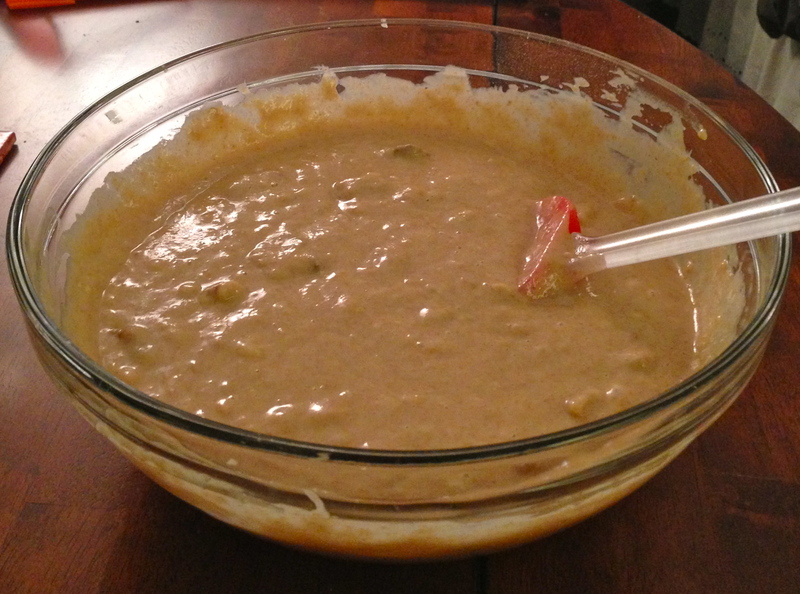 Comine all wet ingredients in a separate, medium sized bowl (pumpkin puree, Greek yogurt, milk, honey. Add eggs and stir until well-combined and relatively smooth. 5. Add wet ingredients to dry ingredients (you will want to add them to the large bowl!) and whisk all ingredients together until well combined. 6. Spoon the batter on to the pan or griddle. (*note: approximately 2 large spoonfuls of batter could be used per pancake in order to make silver dollar-sized pancakes. Make sure that batter is spread in a flat circle. Cook each side approximately 5-10 minutes, or until browned. Continue this until all of the batter is cooked. This recipe will make about 12-15 pancakes, depending on the size of the pancakes and is intended to serve 6 people. These pancakes can be saved in the fridge for 1-2 days or frozen in an air-tight bag or container, with wax paper separating each pancake for easy defrosting. 7. Serve warm and enjoy plain, or with maple syrup, fruit, roasted nuts or any other topping you’d like! one side, done! just a few more minutes until they’re ready to eat!